THE SACRED BONES is a well-written tale with a very timely topic – the tensions between Palestine and Israel – as its core and an interesting idea, based on a pivotal biblical event, woven into the heart of it. Unfortunately, there is one major flaw in the story and this rendered it extremely difficult for me to read. One of the central characters is a geneticist and I became increasingly annoyed by the biological information in the book. Some is correct and some is pure fantasy, but there is also some that is just plain wrong. By the end of the story I was more interested in being annoyed by the genetics issues than in the rest of the book. This was a real shame as, as I said before, the book is well written and should have had me gripped. To summarise, the services of a top geneticist and a leading anthropologist are requested by the Vatican for examination of the contents of a recently-arrived mysterious crate. The crate is opened to reveal a highly ornate ossuary, dating back to around 30AD, and the bones of a man who has very obviously been scourged and crucified. The scientists are sworn to secrecy and embark upon their gruesome task of profiling, dating and describing the find. Meanwhile, there is chaos in Jerusalem, brought about by the recent theft of the aforementioned ossuary from a secret chamber under the mosque on Temple Mount. Fighting between Jews and Muslims escalates, as they accuse each other of disturbing the holy site, and the death toll rises. There does not seem to be a way to solve the problem and the Vatican is not about to own up to its actions any time soon. The best part of the book by far is the very end, when we discover a fabulous twist in the motive for the theft of the ossuary and its contents. Most of the rest left me annoyed and frustrated, although I was pleased that a biblical inaccuracy I noticed at the start was pointed out and clarified by one of the main characters a bit further into the book. 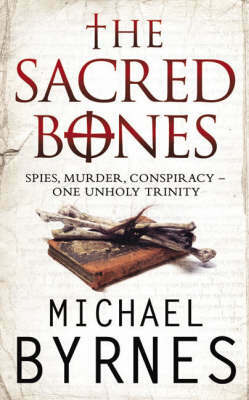 All in all, I thought that THE SACRED BONES was a very disappointing read. Religious-themed crime fiction is among my favourites but this book is way down the list.